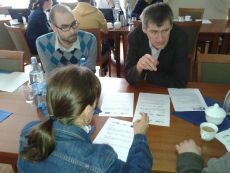 On 14th of April, 2013, the Gdansk’s abc.multimodal team organised a workshop for journalists and public relation officers affiliated with municipal companies. The main idea behind the workshop was to gather ideas for promotional campaigns with respect to cycling as well as to work out a long-term strategy for the adequate promotion of cycling throughout the media. There were 12 participants who attended the workshop and shared their ideas. Within the abc.multimodal project, two campaigns for the promotion of cycling were envisaged for this year. For one, there will be promotion of bike parking facilities. For another, there will be promotion of the new cycling monitor in Gdansk. Within the project abc.multimodal the City of Gdansk is developing the new traffic organisation at Wita Stwosza and Wojska Polskiego streets. Already known as the first cycling street in Poland, the 3,5 km long road will have cycle-friendly infrastructure, including: cycling lanes in both directions, next to the car lanes and bike-boxes with traffic lights at intersections that give priority for cyclists. On 20th of March 2013 the city officials met with local residents to answer their questions regarding the project. The works involving surface reparation, lanes painting and road signs installation will start as soon as the weather allows. The project has been inspired by a series of consultations with inhabitants. Consequently Gdansk’s Strategy for Realization of Cycling Routes was developed. According to this planning document, at the roads with the speed limit of 50 km/h cycle lanes rather than separate cycle ways will be provided. The inhabitants doubted the safety of cyclists and pedestrians in the proposed solution, however they were convinced that the real-life safety of on-road cyclists is far more important than the perceived-but-false safety on separated cycle ways. The proposed project also creates more pleasant and safer environment for pedestrians.